A mobility scooter is a mobility aid equivalent to a wheelchair but configured like a motorscooter. It is often referred to as a power-operated vehicle/scooter or electric scooter as well. James Addison Baker III is an American attorney and political figure. He served as White House Chief of Staff and United States Secretary of the Treasury under President Ronald Reagan, and as U.S. Secretary of State and White House Chief of Staff under President George H. W. Bush. Ronan Tynan is an Irish tenor singer and former Paralympic athlete. During interment, the United States Navy announced it would perform the largest funeral flyover in its history, with what the Navy described as an "unprecedented" 21 F/A-18 Hornets led by Captain Kevin McLaughlin, the commanding officer of Strike Fighter Wing Atlantic whose own aircraft was painted in a special memorial livery. The flyover was known as the "missing man flyover," and featured 21 aircraft in a unique position. This was done as an honor to Bush's Navy pilot service during World War II. The interment ceremony was private; it was not filmed, broadcast on television, or streamed online at the advance request of the Bush family. Only the flyover, as well as the 21-gun salute and the performance of "Taps" that happened at the library grounds, were shown instead. Bush's remains were buried on the early morning of December 7 between the graves of his wife Barbara and his daughter Robin. 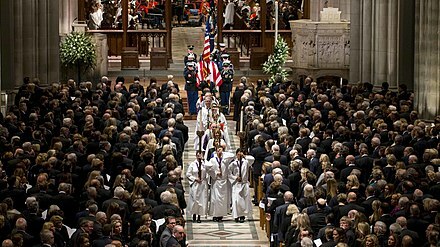 As customary, pallbearers during each movement of the casket containing Bush's remains were drawn from personnel of the United States Army, United States Navy, United States Air Force, United States Marine Corps, and United States Coast Guard. In addition, honorary pallbearers were selected for most movements of the casket. The Bush compound is the summer retreat house of the Bush family. It served as the Summer White House of George H. W. Bush, the 41st President of the United States. It is located along the Atlantic Ocean in the northeast United States, on Walker's Point. Union Pacific 4141 is an EMD SD70ACe locomotive owned by Union Pacific, commissioned in 2005 in honor of George H. W. Bush, the 41st President of the United States. Its paint scheme is based on that of Air Force One, with lettering reading "George Bush 41" painted on the sides in honor of the George Bush Presidential Library and President Bush. On December 26, 2006, Gerald Ford, the 38th President of the United States, died at his home in Rancho Mirage, California at 6:45 p.m. local time. At 8:49 p.m. local time, President Ford's wife of 58 years, Betty Ford, issued a statement that confirmed his death: "My family joins me in sharing the difficult news that Gerald Ford, our beloved husband, father, grandfather and great grandfather has passed away at 93 years of age. His life was filled with love of God, his family and his country." The causes of death listed on the subsequent death certificate were arteriosclerotic cerebrovascular disease and diffuse arteriosclerosis. 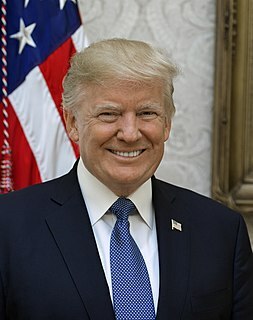 This article shows the variation in the number of living presidents of the United States from the inauguration of the first president of the United States in 1789 until the present. The following table includes all persons who have taken the presidential oath of office. Currently, in addition to the incumbent, Donald Trump, there are four living former presidents: Jimmy Carter (1977–1981), Bill Clinton (1993–2001), George W. Bush (2001–2009), and Barack Obama (2009–2017). St. Martin's Episcopal Church in Houston in the United States was founded in 1952 by J. Thomas Bagby. It is the largest parish of the Episcopal Church in North America with nearly 9,000 members. The parish worships in both traditional and contemporary liturgical styles in the evangelical Anglican and mainline Anglican tradition. The church offers Christian education programs, as well as numerous outreach and missions opportunities, and a variety of programs and events for all ages. The death and state funeral of Pierre Trudeau took place in September 2000. Pierre Trudeau was the 15th Prime Minister of Canada, serving from 1968 to 1984, with a brief interruption in 1979–1980. Trudeau died on September 28, 2000. His casket lay in state on Parliament Hill from September 30 to October 1 and the following day at Montréal City Hall. On October 3, a state funeral was held at Notre-Dame Basilica in Montreal. Lee Kuan Yew, the founding Prime Minister of Singapore and former leader of the People's Action Party, died at the age of 91 on 23 March 2015, after being hospitalised with severe pneumonia on 5 February 2015. Many world leaders issued public condolences. Sully is a yellow labrador dog employed as a service dog for disabled military veterans in the United States. He served with the former President of the United States George H. W. Bush during the last six months of his life, until Bush's death on November 30, 2018. 1 2 3 "News Release – 41W – NR02" (PDF). Joint Task Force – National Capital Region Media Operations Center. Archived (PDF) from the original on December 2, 2018. Retrieved December 2, 2018. ↑ "Stage I". Official U.S. State Funeral. The U.S. Army Military District of Washington. Archived from the original on December 2, 2018. Retrieved December 1, 2018. ↑ "Stage II". Official U.S. State Funeral. The U.S. Army Military District of Washington. Archived from the original on December 2, 2018. Retrieved December 1, 2018. ↑ "Stage III". Official U.S. State Funeral. The U.S. Army Military District of Washington. Archived from the original on December 2, 2018. Retrieved December 1, 2018. ↑ "Photo P012712PS-0676". The Whitehouse. January 27, 2012. Archived from the original on March 27, 2014. Retrieved April 24, 2013. ↑ Updegrove, Mark K. (July 15, 2012). "An Exclusive Conversation with President and Mrs. Bush". Parade . Archived from the original on February 16, 2017. Retrieved February 15, 2017. 1 2 3 4 Baker, Peter. "'I Love You, Too': George Bush's Final Days". The New York Times. Archived from the original on December 1, 2018. Retrieved December 1, 2018. ↑ Staff. "George H.W. Bush off ventilator, watched inauguration". USA Today . Archived from the original on December 2, 2018. Retrieved December 1, 2018. ↑ Eltagouri, Marwa. "George H.W. Bush hospitalized one day after the funeral for his wife, Barbara". The Washington Post . Archived from the original on December 2, 2018. Retrieved December 1, 2018. ↑ Samuels, Brett (November 27, 2018). "Obama meets George H.W. Bush during visit to Houston". The Hill . Archived from the original on December 1, 2018. Retrieved December 1, 2018. ↑ Gangel, Jamie; Stracqualursi, Veronica (December 2, 2018). "Former President George H.W. Bush's last words, as spoken to his son, George W. Bush". CNN. Archived from the original on December 2, 2018. Retrieved December 1, 2018. ↑ "Former President George H.W. Bush dies". WLEX-TV . December 1, 2018. Retrieved December 1, 2018. ↑ Steinberg, Marty (December 1, 2018). "Former President George HW Bush dead at age 94". CNBC . Archived from the original on December 1, 2018. Retrieved December 1, 2018. ↑ @realDonaldTrump (November 30, 2018). "Statement from President Donald J. Trump and First Lady Melania Trump on the Passing of Former President George H.W. Bush" (Tweet) – via Twitter. ↑ Fortin, Jacey (December 1, 2018). "Politicians and Family React to George Bush's Death". New York Times . Archived from the original on December 1, 2018. Retrieved December 1, 2018. ↑ "Jimmy Carter: George H.W. Bush's administration was marked by 'grace, civility, and social conscience'". December 2018. Archived from the original on December 2, 2018. Retrieved December 2, 2018. 1 2 "Obama, Trump, celebrities react to George H.W. Bush's passing". WTVH-TV . December 1, 2018. Retrieved December 1, 2018. ↑ "Statement by Mayor Sylvester Turner on the death of President George H.W. Bush". Office of the Mayor. City of Houston . Retrieved December 1, 2018. ↑ Associated Press (December 1, 2018). "The Latest: New Zealand Prime Minister Offers Condolences". U.S. News & World Report . Retrieved December 11, 2018. ↑ "Death of George Bush: President Bouteflika sends condolence message to US President". www.aps.dz. Algeria Press Service. Retrieved 2018-12-16. deep sadness [at the death of a] statesman who had a strong influence on the American policy. ↑ "Leaders from around the world react to George H.W. Bush's death". December 1, 2018. Archived from the original on December 3, 2018. Retrieved December 3, 2018. ↑ "HM King condoles with former US president". www.bna.bh. Bahrain News Agency. Retrieved 2018-12-16. 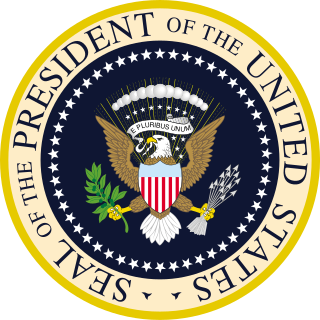 ↑ "PM Mottley extend condolences to the US on the passing of 41st president – Barbados Today". December 3, 2018. Archived from the original on December 4, 2018. Retrieved December 4, 2018. It is with a sense of regret that we in Barbados note the passing of the 41st president of the United States, the late George Herbert Walker Bush...The Government and people of Barbados extend deepest condolences to the people of the United States of America and to his family. May he rest in peace. ↑ "Condolences over passing of 41st U.S. President George H. W. Bush". President of the Republic of Belarus. December 1, 2018. Retrieved December 4, 2018. ↑ "Bush: A friend to Bermuda | the Royal Gazette:Bermuda News – Mobile". ↑ "Trudeau and other Canadians offer condolences to family of George H.W. Bush". CTV News. The Canadian Press. December 1, 2018. Archived from the original on December 1, 2018. Retrieved December 1, 2018. [Trudeau said] George H. W. Bush’s exemplary service and deep commitment to his country informed everything he accomplished over his decades in public life. Sophie and I offer our condolences to his family and the American people on his passing. ↑ ERR, ERR News (December 1, 2018). "Estonia offers condolences to US on death of President George H.W. Bush". Archived from the original on December 2, 2018. Retrieved December 3, 2018. [Kaljulaid said] long and fruitful lives are worth celebrating. My condolences to the family of George H. W. Bush. ↑ "Former US presidents, Queen Elizabeth, the Dalai Lama, and more react to the death of former president George H.W. Bush". The world has lost a statesman and a leader who was an example to us all. I personally have lost a friend, I will never forget the role he played in making Europe a safer and more united place following the fall of the Berlin Wall and the Iron Curtain. ... President Bush's calmness, leadership and close personal relationships with Helmut Kohl and Mikhail Gorbachev were decisive in restoring peace and freedom back to so many people across our Continent. We Europeans will forever remember this. ... [served his country] with honor, bravery and dignity. ... I personally have lost a friend. ↑ "Remarks by President Trump and Chancellor Merkel of Germany Before Bilateral Meeting". The White House. Retrieved December 5, 2018. I mourn George Bush, the 41st president of the United States, as the chancellor of the German Federal Republic but also as a German who, without the results of his policies, would hardly be standing here. ... And he’s the father, or one of the fathers, of the German unification, and we will never forget that. ↑ "Angela Merkel: Without George H. W. Bush, I wouldn't be here". POLITICO. December 1, 2018. Archived from the original on December 2, 2018. Retrieved December 1, 2018. ↑ "Pope Francis sends condolences to Bush's family". WKRG. December 5, 2018. Retrieved December 6, 2018. [Francis prays that the Bush family] finds strength and peace as it prepares to bid farewell..."; [Parolin said] "Commending President Bush's soul to the merciful love of Almighty God, His Holiness invokes upon all who mourn his passing the divine blessings of strength and peace. ↑ "Áder Sends Condolences over Bush's Death". December 2018. Archived from the original on December 3, 2018. Retrieved December 3, 2018. ↑ Post, The Jakarta. "Indonesia's foreign minister offers condolences following Bush senior's death" . Retrieved December 3, 2018. My prayers go out to the family and friends and may they be given strength and courage during this time of sorrow. ↑ Donaghy, Gerard. "Irish President Michael D Higgins offers condolences following death of George Bush – The Irish Post". Archived from the original on December 2, 2018. Retrieved December 3, 2018. People in Ireland will have learned with sadness of the death of former President of the United States of America, George HW Bush. ↑ "Kurdistan Region PM Barzani extends condolences to Bush family". On occasion of the passing of former US President George Bush Senior, I convey my condolences to his family, especially to his Excellency, former US President George W. Bush, and his friends. ↑ "King sends condolences over passing of former U.S. President George H. W. Bush | Jordan News | Ammon News". ↑ Day, Brian (December 1, 2018). "Kuwait Sends Respects to George H.W. Bush". KTLA. Archived from the original on December 1, 2018. Retrieved December 1, 2018. condolences to George W. Bush and to President Donald Trump. ... [noted Bush's efforts to] create a new international order based on justice and equality among nations. ... never forgot the Kuwaiti people and will remain in their memory. ↑ "The Latest: Iran notes death of President George H.W. Bush". Charlotte Observer . Associated Press. December 1, 2018. Archived from the original on December 1, 2018. Retrieved December 1, 2018. ↑ "Jeenbekov extends condolences to US President over passing of George HW Bush". Bishkek: Kabar News Agency. December 3, 2018. Retrieved December 13, 2018. ↑ "King Mohammed VI Offers Condolences on Death of George HW Bush". December 2, 2018. Archived from the original on December 3, 2018. Retrieved December 3, 2018. ↑ "The Latest: Iran notes death of President George H.W. Bush". Charlotte Observer . Associated Press. December 1, 2018. Archived from the original on December 1, 2018. Retrieved December 1, 2018. statesmanship played a key role in helping to end the Cold War, which bought democracy to millions of people in Europe and diminished the threat of nuclear war. George H.W. Bush was a strong supporter of the international rules-based system, the rule of law and democratic values. ↑ "The Latest: New Zealand Prime Minister offers condolences". Associated Press. December 1, 2018. Archived from the original on December 1, 2018. Retrieved December 1, 2018. ↑ "George Bush: Buhari, Obasanjo, Send Condolences To United States – THEWILL". thewillnigeria.com. Archived from the original on December 4, 2018. Retrieved December 4, 2018. [Buhari said] the passing of George H.W. Bush is a loss to the entire world, not just America, especially the many people he inspired. "; "[Obasanjo said] President Bush's death is a loss not only to his immediate family and to the United States of America but also to the entire world. ↑ "His Majesty sends condolences on death of former U.S. President Bush". December 2018. Retrieved December 3, 2018. sincere condolences to the President, the family of the deceased, and the American people. ↑ "Pakistan offers condolence over death of ex-US president H.W Bush". Archived from the original on December 3, 2018. Retrieved December 4, 2018. Grieved at passing away of President H.W. Bush. Share pain of family and American people. ↑ December 2018, Published 4 days ago on 03. "Panama mourns passing of Bush, who ordered country's invasion in 1989 - Malay Mail". www.malaymail.com. Retrieved December 7, 2018. expresses its profound condolences to the Bush family, the government of the United States of America, as well as its people ... [the government] conveys its deepest condolences and shares its hope that the strength that characterizes the Bush family and the American people will make it possible to overcome this moment of pain. ↑ "Xi sends condolence message to Trump on death of Bush" . Retrieved December 3, 2018. ↑ "PH condoles with US on passing of ex-President George H.W. Bush". Archived from the original on December 3, 2018. Retrieved December 4, 2018. ↑ "Polish President sends condolences after death of George H.W.Bush". Archived from the original on December 3, 2018. Retrieved December 3, 2018. Statesman, WW2 veteran, Cold War warrior and honorary citizen of my native Kraków, he was always a great friend of Poland and Poles. ↑ Moran, Lee (December 1, 2018). "'Generous American Patriot': World Leaders Pay Tribute To George H.W. Bush". Huffington Post. Retrieved December 2, 2018. ↑ "World leaders remember George H.W. Bush". ABC News. December 1, 2018. Archived from the original on December 2, 2018. Retrieved December 2, 2018. deepest condolences ... My fellow citizens and I will always cherish the memory of George Bush Sr.
↑ "Saudi King, Crown Prince offer condolences to US president". Al Arabiya English . December 3, 2018. Archived from the original on December 4, 2018. Retrieved December 4, 2018. ↑ "Predsednik Republike Slovenije | Predsednik Pahor izrazil sožalje ob smrti nekdanjega ameriškega predsednika Georgea H. W. Busha". www.up-rs.si. Retrieved December 5, 2018. Bush was a great leader and extraordinary man who devoted his life to public service and will always be a role model for leaders to come. 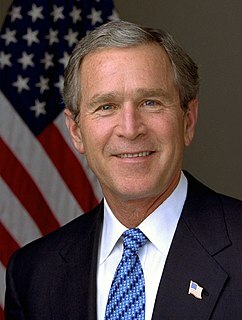 ... Bush led the U.S. in the time of great changes that dramatically changed Europe. Europeans will never forget his devotion to freedom and democracy. It was during Bush's presidency that Slovenia gained its independence in 1991 and established diplomatic relations with the U.S. a year later. ↑ "Ramaphosa sends condolences to USA on passing of former president Bush". December 2018. ↑ "Former US presidents, Queen Elizabeth, the Dalai Lama, and more react to the death of former president George H.W. Bush". [Bush] made noble endeavors to bring peace on the Korean Peninsula and strengthen the ROK-US alliance. President George H.W. Bush will be long remembered in the hearts of the Korean people. ↑ "The Latest: Iran notes death of President George H.W. Bush". Charlotte Observer . Associated Press. December 1, 2018. Archived from the original on December 1, 2018. Retrieved December 1, 2018. He was in fact the first American President that I was privileged to meet. I recall being deeply touched by your father's concern for the Tibetan people and the situation in Tibet. It is truly admirable to have lived over 94 years. While nothing can replace the loss of a father, we can rejoice in the fact that his was a meaningful life, dedicated to public service. I commend your parents for encouraging their children, including you my dear friend, to devote yourselves to the service of others. ↑ Poroshenko, Petro (December 1, 2018). "The former US President George W. Bush passed away. True leader and statesman. 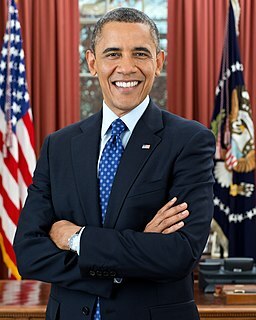 This man - the legend, under whose presidency the world saw the end of the Cold War. This man - the era, who then witnessed the restoration of Ukraine's independence.pic.twitter.com/VYeXvR1Q6B". Twitter . Retrieved December 22, 2018. True leader and statesman. This man - the legend, under whose presidency the world saw the end of the Cold War. This man - the era, who then witnessed the restoration of Ukraine’s independence. ↑ Ford, Kaelyn (December 1, 2018). 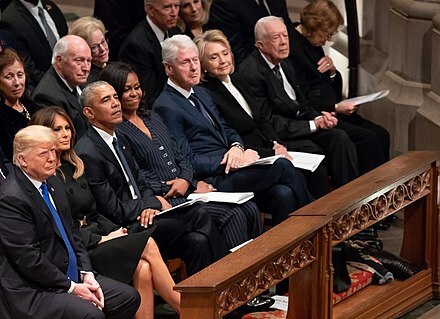 "World leaders remember George H.W. Bush". ABC News. Archived from the original on December 2, 2018. Retrieved December 2, 2018. [The Queen said] It was with sadness that I learned of the death ... a great friend and ally ... a patriot, serving his country with honour and distinction in Office and during the Second World War. Prince Philip and I remember our days in Texas in 1991 with great fondness. My thoughts and prayers are with President Bush's family and the American people. ↑ "UAE leaders offer condolences on death of George H. W. Bush". Khaleej Times. December 1, 2018. Archived from the original on December 1, 2018. Retrieved December 1, 2018. Our condolences to the Bush family and to the American people on the passing of George H.W. Bush, who we remember as a firm ally and friend..
↑ "Vietnamese Ambassador pays respects to former US President George H.W.Bush". vietnamplus.vn. December 5, 2018. Retrieved December 6, 2018. Vietnamese Government and people are in grief over the passing of the 41st US President. ... extended the Vietnamese Government and people's deepest condolence to the US Government and people, particularly to Bush's family. ... long-term strategic vision and strong leadership ... helped to lay a firm foundation for the normalization of the two countries' relations and later friendship and cooperation. Vietnamese people always remember Bush's visit to Vietnam in 1995 after the two countries established their diplomatic relations. ↑ UN Affairs (December 1, 2018). "UN chief saddened at news of death of former US President George H.W. Bush". United Nations . Retrieved December 22, 2018. ... a leader who served the United States with distinction and supported the United Nations with dedication. ... Across the years I was consistently impressed by his compassion, instinct for moderation and commitment to public service. ↑ Army Regulation 600–25 Salutes, Honors, and Visits of Courtesy (PDF). Washington, D.C.: U.S. Army. 2004. Archived (PDF) from the original on June 7, 2016. Retrieved December 1, 2018. 1 2 "Presidential Proclamation Announcing the Death of George H.W. Bush". whitehouse.gov. White House. Archived from the original on December 1, 2018. Retrieved December 1, 2018. ↑ Rapaport, Wes (December 3, 2018). 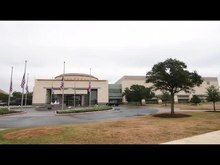 "Federal buildings to close Wednesday to honor George H.W. Bush". WPRI . Archived from the original on December 3, 2018. Retrieved December 3, 2018. ↑ Birnbaum, Emily (December 2, 2018). "Supreme Court delays arguments for Bush national day of mourning". The Hill . Archived from the original on December 3, 2018. Retrieved December 3, 2018. ↑ McCormick, Emily (December 5, 2018). "Stock futures recover, markets close Wednesday". Yahoo . Retrieved December 6, 2018. ↑ "George H. W. Bush: flag instructions". college-of-arms.gov.uk. College of Arms . Retrieved December 6, 2018. ↑ "Canada to fly flags at half-mast in honour of George H.W. Bush". Canadian Broadcasting Corporation . Canadian Press. December 4, 2018. Retrieved December 5, 2018. ↑ Wiley, Kenney (December 1, 2018). "Midnight gathering at Bush Library pays tribute to former president". The Eagle. Archived from the original on December 3, 2018. Retrieved December 1, 2018. ↑ "People pay respects for George H.W. Bush in Maine". Belleville News Democrat . Associated Press. December 1, 2018. Archived from the original on December 2, 2018. Retrieved December 1, 2018. 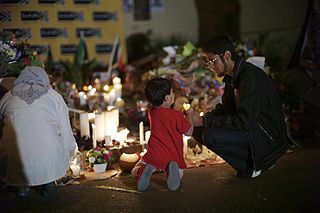 ↑ "Makeshift memorial formed outside George H.W. Bush's Houston home". KHOU-TV . December 1, 2018. Archived from the original on December 2, 2018. Retrieved December 1, 2018. ↑ "Dole Institute to have memorial display, book for Bush". Salina Post. December 1, 2018. Archived from the original on December 2, 2018. Retrieved December 1, 2018. ↑ "City of Houston to hold public memorial for President George H.W. Bush". KHOU-TV . December 2, 2018. Archived from the original on December 3, 2018. Retrieved December 1, 2018. ↑ "Monday Night Football: Redskins vs. Eagles". Newsday . December 3, 2018. Retrieved December 11, 2018. ↑ "Army beats Navy for third straight season to improve to 10-2". ESPN . Associated Press. December 8, 2018. Retrieved December 11, 2018. ↑ Orin, Deborah (July 18, 2005). "Bill bury quiet". New York Post . Archived from the original on December 1, 2018. Retrieved December 1, 2018. 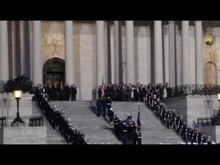 1 2 "State Funeral for George H.W. 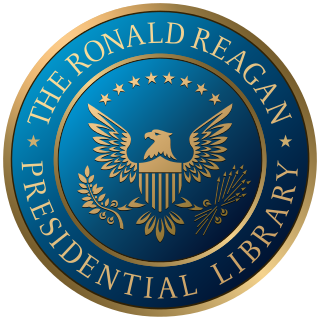 Bush, the 41st President of the United States Official Schedule" (PDF). Military District of Washington. U.S. Army. Archived (PDF) from the original on December 3, 2018. Retrieved December 2, 2018. ↑ "Air Force One arrives in Houston to transport former President George H.W. Bush's casket to D.C." KPRC-TV . December 2, 2018. Retrieved December 2, 2018. 1 2 3 4 Ketterer, Samantha (December 3, 2018). "George H.W. Bush's remains arrive in Maryland on "Special Mission 41"". Houston Chronicle . Archived from the original on December 3, 2018. Retrieved December 3, 2018. 1 2 3 4 5 6 "VP Mike Pence offers nation's condolences to family of President George HW Bush". KGO-TV . Associated Press. December 3, 2018. Retrieved December 3, 2018. ↑ "Funeral Service Program". Washington National Cathedral. Archived from the original (PDF) on December 6, 2018. Retrieved December 5, 2018. ↑ "Ringing World BellBoard". bb.ringingworld.co.uk. Retrieved 2019-03-16. ↑ "President George HW Bush honored in private Houston funeral service". ABC 13 Eyewitness News. December 6, 2018. Retrieved December 10, 2018. ↑ "George Herbert Walker Bush" (PDF). St. Martin's Episcopal Church. December 6, 2018. Retrieved December 10, 2018. ↑ Willingham, AJ (December 3, 2018). "George H.W. Bush will journey to his final resting place on a train whose engine is named for him". CNN. Retrieved December 3, 2018. ↑ "Bushes depart on first presidential funeral train since 1969". star-telegram. Retrieved December 7, 2018. 1 2 "President Bush arrives in College Station for burial". Austin American Statesman . December 7, 2018. Retrieved December 7, 2018. 1 2 3 Eckstein, Megan. "Navy Will Perform Unprecedented 21-Fighter Flyover for Bush Funeral". usni.org. United States Naval Institute . Retrieved December 6, 2018. 1 2 "Navy performs 21-aircraft missing man flyover to honor President Bush". WTLV. Retrieved December 7, 2018. 1 2 Wilson, Haley (December 6, 2018). "Fort Sill honors late President George H.W. Bush with 21-gun salute". KSWO-TV . Retrieved December 6, 2018. ↑ "Fort Stewart honors late President Bush with gun salutes". WSAV-TV . December 6, 2018. Retrieved December 6, 2018. ↑ "Fort Drum Salutes President George H.W. Bush". WWNY-TV . December 6, 2018. Retrieved December 6, 2018. ↑ Former vice president, Walter Mondale did not attend. ↑ Grubb, Shaffer (December 5, 2018). "Five decades of presidents honor Bush". latimes.com. Los Angeles Times . Retrieved December 6, 2018. ↑ "Carlos Salinas de Gortari honra a Bush padre en Washington". Excélsior. December 5, 2018. Retrieved December 6, 2018. ↑ Calvin Woodward, Laurie Kellman and Ashraf Khalil (December 5, 2018). "Bush celebrated with praise, humour at D.C. farewell". The Associated Press. Retrieved December 5, 2018. ↑ "Americans from all walks of life come to Capitol to honor President George H.W. Bush". ABC News . December 4, 2018. ↑ "Lech Wałęsa to fly with Polish president for Bush's funeral". Radio Poland. December 4, 2018. ↑ "Taiwan's Legislative Speaker to attend George HW Bush memorial". Taiwan News . December 4, 2018. ↑ Gangel, Jamie; Watkins, Eli (December 4, 2018). "George H.W. Bush funeral: Former presidents, world leaders to attend". Cable News Network. Retrieved December 8, 2018. ↑ "Assumption College graduate among honorary pallbearers at services for President Bush". Worcester Telegram. December 5, 2018. Retrieved December 5, 2018. ↑ "In Celebration of and Thanksgiving for the Life of George Herbert Walker Bush" (PDF). cathedral.org. Washington National Cathedral . Retrieved December 6, 2018. ↑ Fennell, Taylor (December 3, 2018). "Sharp to serve as pallbearer". The Battalion. Retrieved December 3, 2018. ↑ Collins, Larry (December 5, 2018). "Texas A&M Remembers George H.W. Bush Before Burial in College Station". WDFW-TV . Retrieved December 5, 2018. Wikimedia Commons has media related to Death and state funeral of George H. W. Bush .